If you need a Change in Your Life, join us in our Muay Thai Classes designed for everyone! Muay Thai, also known as the art of eight limbs, offers many incredible benefits over other forms of martial arts in Singapore. Once taught to the armies of Thailand for self-defense in war, it is now modernized and learnt by many men, women and children. We welcome you to having a pleasant experience with us at JR Muay Thai. The journey to greater heights has just started! Look through a wide spectrum of classes and locations across Singapore, and choose to start off your journey. Professional and Certified Muay Thai Trainers who will guide you through your journey. Certifications available too! Muay Thai is a martial fighting art that has its origins in Thailand. This style of kickboxing puts your whole body into action during combat. In recent years, Muay Thai has become popular in many parts of the world, and it is just beginning to take root in Singapore. 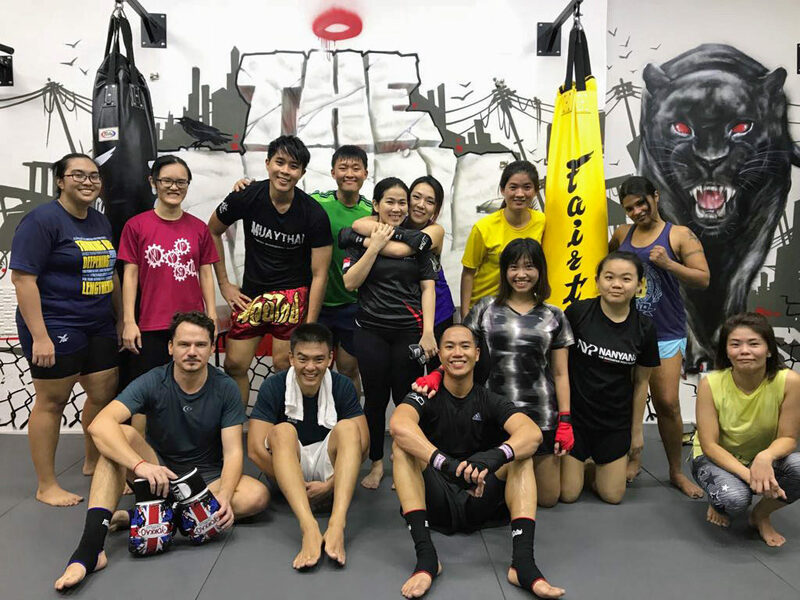 Although other forms of martial arts including Karate and Taekwondo have been present in Singapore for years, many people who are taking up Muay Thai in Singapore think it is a better art of learning self-defense and self-discipline compared to karate and Taekwondo. With Muay Thai training, you won’t need one of those exaggerated weight loss programs that never seem to work. The arduous aerobic and anaerobic exercises incorporated into Muay Thai boosts your body’s metabolism leading to natural fat burn and a well-toned physique. Think of it as killing two birds with one stone. You lose weight and acquire some much needed self-defense tactics. Book Your First Trial Class Now! To begin with, Muay Thai is both aerobic and anaerobic. It stresses the cardiopulmonary system, leading to improved cardiovascular performance. You may not find the cardiovascular conditioning you get from Muay Thai in any other sport. Kicking and legwork form a considerable part of Muay Thai. The roundhouse kick, which is most common type strengthens the body’s lower musculature, gives your lower muscles more endurance, agility and stability. Various other kicks and footwork drills incorporated in Muay Thai give you the same benefit. Muay Thai not only makes you physically stronger but also improves your mental wellness. As you continue training in Muay Thai, you gain courage and confidence. You become more self-confident. Additionally, the bulk of techniques taught in Muay Thai require that you be aware of your opponent’s strikes at all times even as you device attack tactics. This leads to increased mental acuity, which extends to your day-day life. Muay Thai training puts a lot of emphasis on self-discipline, self-control, respect for others and a strict adherence to the rules of the game. Needless to say, the character traits that you learn from Muay Thai extend outside the ring. You become more sociable and likable by everyone who you interact with. Is Muay Thai Training for You? If you like to challenge yourself and you enjoy learning new skills, Muay Thai training will definitely appeal to you. Experienced martial arts fighters will also find training in Muay Thai an invaluable addition into their skillsets. Presently, we support several gyms all around Singapore that offer Muay Thai training and finding one shouldn’t be difficult. However, before you sign up for our Muay Thai classes, make sure that you have done due diligence to establish the expertness of the trainers! You do not need to. Complete beginners are welcome to join. We also conduct classes for Amateurs and for students who wish to compete and fight professionally. Do you provide certifications for Muay Thai? Yes, we do provide certifications when you join our Personal Training classes. Our Trainer will assess your level during your first trial and will recommend a suitable level for you to take up. I would like to become a professional fighter. Is that possible if I train at your gym? Yes. When you join our classes, do talk to our trainer(s) so that we are aware of your aspiration. We will help you meet your goal! What is a typical group class size? It depends on the day and timing of the class that you choose. Our classes usually have 8 to 15 pax, but not restricted to this number. Boxing gloves and equipment are provided at all our gyms. Hand wraps are not provided. If you own a glove and prefer to use yours, feel free to bring it along. You are advised to bring along a water bottle and a towel. Join us for a Trial now! Price indicated is applicable to First Timers, for Trial only.